I was walking around my neighborhood the other day and saw a seedpod on the ground tucked under some shrubs. My eyes lit up- I recognized it immediately and couldn't believe I had never noticed the tree. I looked up and there it was, a black walnut (Juglans nigra)! So big deal- to most people this doesn't mean anything. But black walnuts are ridiculously important trees- not only are they a great food source, they're extremely valuable in terms of lumber. They make great shade trees, wonderful natural lightning rods, and are just plain beautiful. What I love about them too is that though I have enjoyed the walnuts before, I know better than to just reach down and try to crack open the pod to reach them- notoriously hard to extract, but moreso the pod will secret a substance on your hands that will stain them brown for days or weeks. 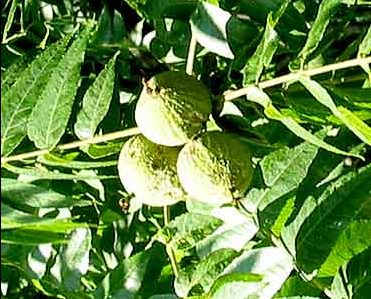 Black walnuts are alleopathic- they produce a chemical that will kill other plants around it. Interestingly (to me anyway) some really common plants like goldenrod are alleopathic to the walnut. Can't we all just get along? The shells are used in a billion different ways- it's one of the hardest shells to crack, and the ground up shell is used to clean engines, polish metal, and as a plaster-effect paint. The bark can be used to treat toothache, the husk as a treatment for colic and inflammation. This is really only the tip of the iceberg! Anyway, an awesome botanical find.